the last update is a long time ago and there are two reasons I did not supply you with news about the project. On one hand the Samba is at Mark´s place again and all I heard from his side since I dropped the Bus there was that he was working on the body but didn´t want to send pictures before he had finished a certain stage. By now I know him so well that this could only mean he will present me something big, so I was patient. 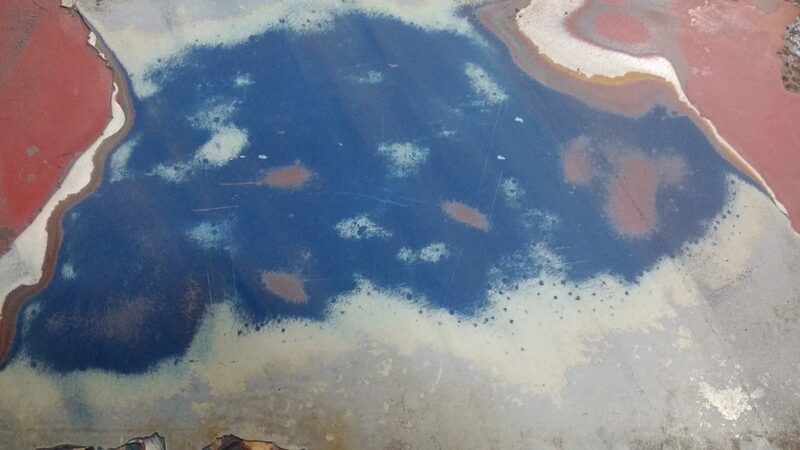 On the other hand I am currently working on the sunroof mechanism which is still here with me, but so far I do not have too much success due to a lack of time and the complicatedness plus the level of rust damage I am facing here. I will present you some results regarding the sunroof, but I still need some time. I need a lot of time to be honest. No wonder Mark was much faster than me showing up with something worth to share with you and you better believe it´s something impressive! You surely remember the last blog update showing Mark´s stunning result of his attempt to bring a little of the Samba´s original paint back to the daylight which was hidden under three layers of different colors. As you know he started with a small area around a side window, but what he is coming up with now is much, much more. 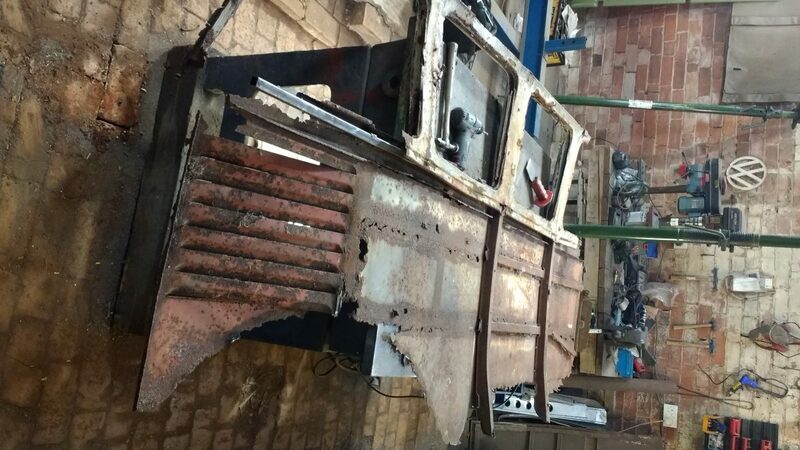 Mark removed the big left side panel from the metal cage he has welded on the chassis this spring to fix the surviving panels on, giving an impression of a Bus in the Amersfoort show. 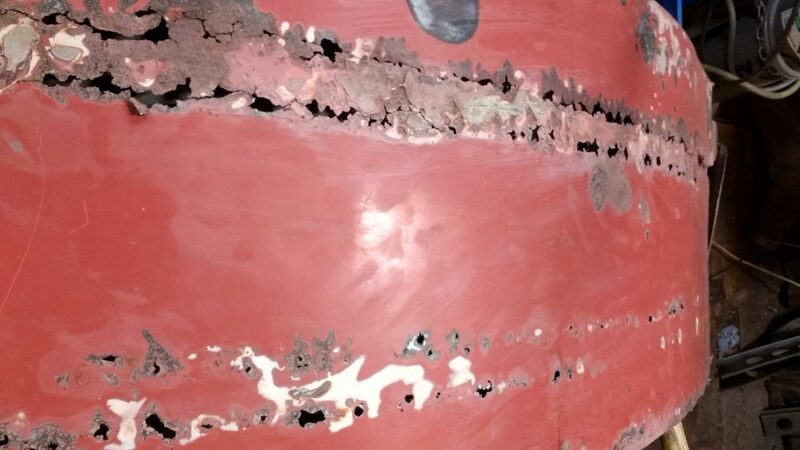 As you can see in the following picture the side panel was in poor state, many little plus some big rust holes all over the place and the lower section is gone at all. What kind of optimism you got to have in your mind dreaming of saving this panel! Even a journey of a thousand miles begins with a single step and you got to start somewhere if you want to bring back some structure in this fragile panel…. Someday in the 50s somebody resprayed the Samba in blue color…. ….and also yellow seemed to be in fashion back then! But Mark Spicer is not a dreamer he goes much further. 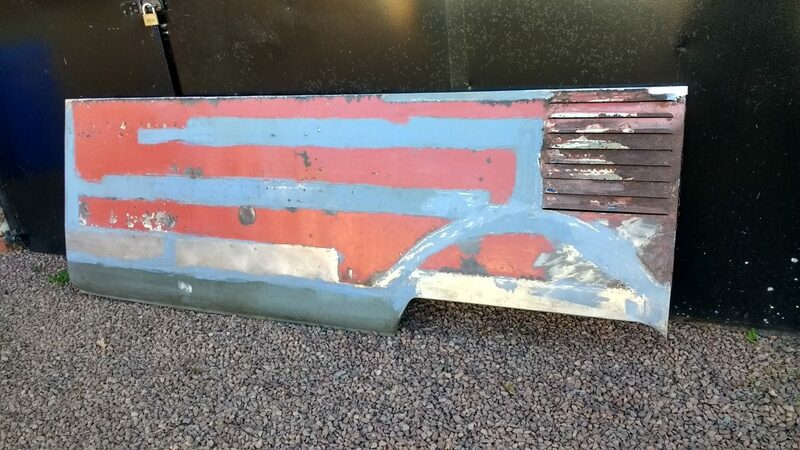 He makes saving the panel real, regardless the panel seems to hold together by nothing else but the three thick layers of different cheap paint which the former owners applied on the Samba. But just saving the panel is not enough for Mark. He goes for nothing less than saving the original sealing wax red paint as well. Unbelievable? Just check out the pictures below! Would you have expected that there is still so much savable original color under all this layers of paint? I wouldn´t! But how to fix all this rust holes without damaging the original sealing wax red? Mark knows. Mark removed all the yellow, blue and ivory paint layers extremely careful to bring back the original sealing wax red color of August ´51. Plus he also fixed the uncountable rust holes one after another by a brilliant welding job. Sure it would have been so much easier just to cut off the lower 60 centimeters and replace it by a new side panel, either NOS or aftermarket. 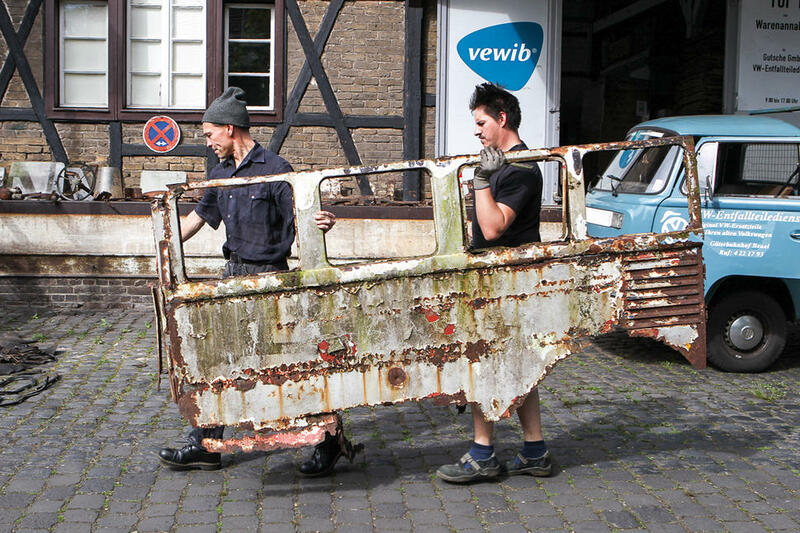 But this wouldn´t be the way Mark and me want this Samba to be restored! If we would go this direction we would end up with not much more of the original ´51 substance, but an ID-plate, the axles, the engine and maybe 5% of the body. 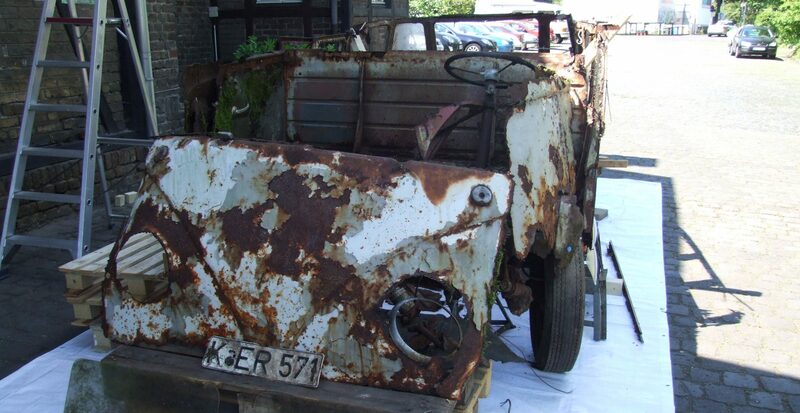 This just wouldn´t be a ´51 Samba anymore in my eyes and this car wouldn´t tell any story. That´s why we go the hard way! If anybody out there still doubts about the philosophy of this project this job shown here should convince him unless he is completely ignorant. 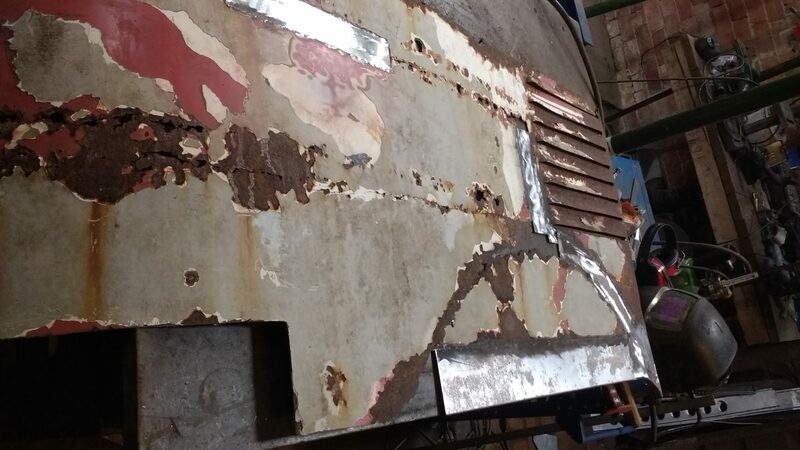 Before we go to the very last picture showing the result of Mark´s brilliant work, check out here the state of the side panel in May 2017….. 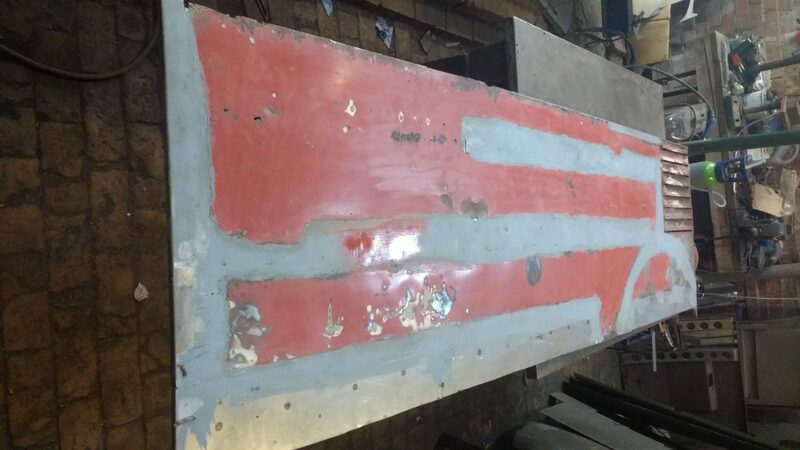 Nothing but absolutely amazing how much of the original paint Mark has set free (beside the wonderful welding job he has done!). 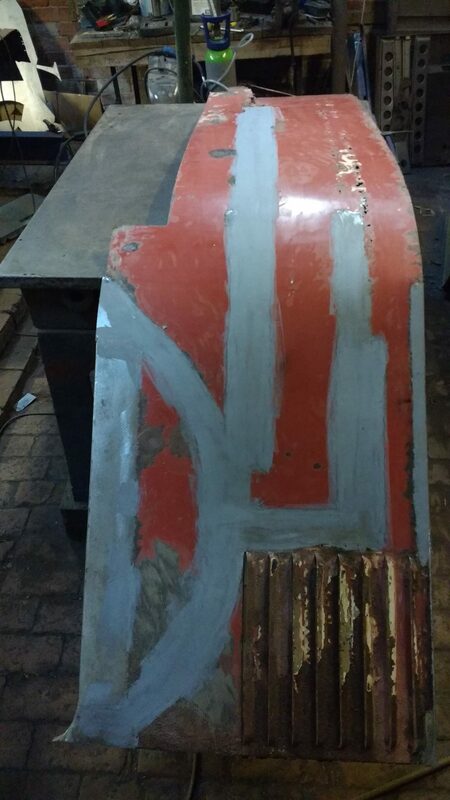 Too bad the Samba hadn´t any cab doors when it was found, so we can´t continue saving original paint at the doors now. But anyway I am looking forward to see the next body piece to be cured by Mark´s magic hands, there are still some of them waiting -waiting as we are all waiting for this story to be continued. 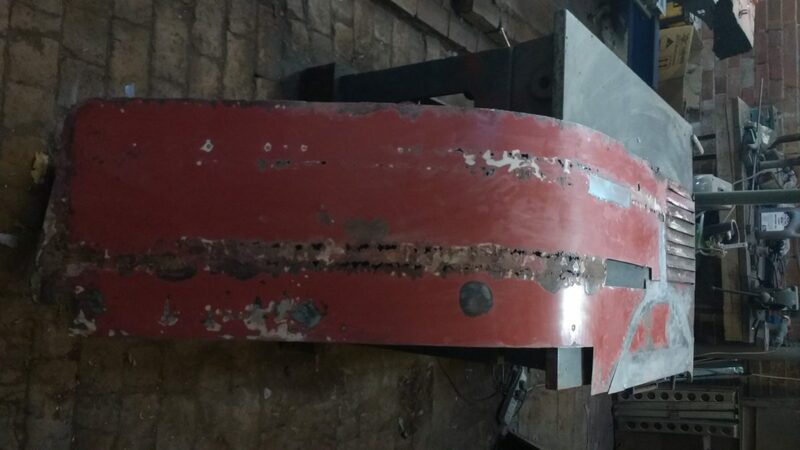 In the meantime please have a look in your garage if you maybe got a pair of Barndoor cab doors there waiting to be part of this amazing project. Great progress Florian and Mark! 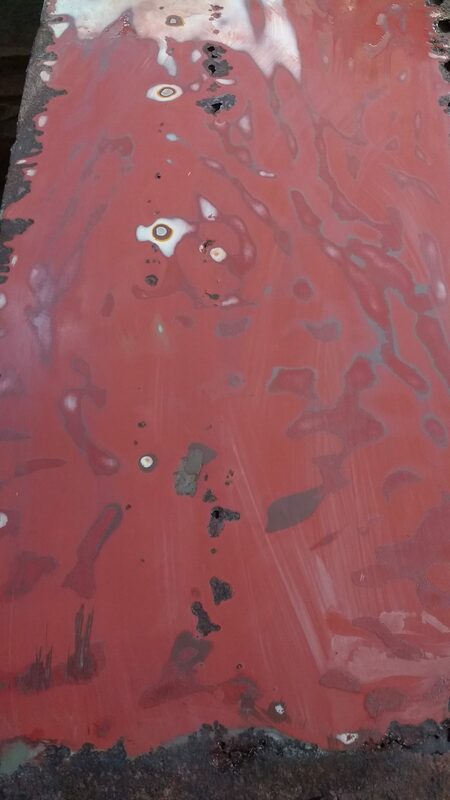 Just curious, as you are trying to protect and preserve the original sealing wax red finish, will you paint the exposed metal areas red, or will you just clear coat the whole panel as it is now? we will preserve all surviving areas of the sealing wax red and we will paint all repaired areas in fresh sealing wax red, so you will cleary see what is still first original paint and what is repaired. Yes, the Samba will look kind of strange this way in the end, but we want this bus to show very honestly what is still original material and what is replaced or reconstructed. There is an example for this kind of restauration: the famous “Frauenkirche” in Dresden / (East-) Germany. This is a big church in the center of Dresden. When Dresden was bombed to the ground in spring 1945 the church was nearly totally destroyed, just check some pictures in the net. The communist East German government decided just to leave the pile of stones as it was to be a monument showing the cruelty of war. When Germany was reunited many Dresden citizens wanted the church to be reconstructed again. While other said this is impossible or the result would be a soulless clone, the first group started the project anyway. Check the net for the result. Today the church shows two styles of stones it is built from: the fresh bright beige stones and the old original stones still black burned by the fire storm of 1945. So everyone can see and feel the story this building is telling. Nobody calls the church a “clone” today. Sure it is not the old Frauenkriche, but it´s a monument by its own. So, that´s the way I want the Samba to be. Not a soulless clone, but a car telling an unique story. Thank you for the reply, and I would have appreciated you either going clear coat or new paint, but I think the new paint with the original paint will be fantastic! This is a very wonderful resurrection, much like the church. I was not familiar with that, but enjoyed reading the story, so thank you for that as well! Look forward to the next update. Very Interesting progress. You are a very passionate person with respect to this Samba project. I wish you continued best wishes as you wrestle this project to completion.